BitTorrent is used by millions of people every day, even in places where you wouldn't really expect. New data suggests that employees at the FBI's Criminal Justice Information Services Division are sharing movies and TV-shows with the rest of the world. Is the FBI gathering information on BitTorrent users, or could it be that the feds harbor in-house pirates? 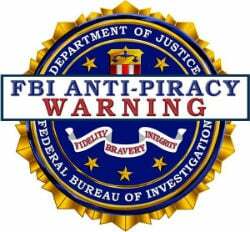 Online piracy is a serious crime according to the FBI. “It’s a growing threat—especially with the rise of digital technologies and Internet file sharing networks,” they write on their website. Over the past years the FBI has been involved in many piracy related cases. The high-profile Megaupload investigation for example, where a federal agent used an “undercover computer” to browse the file-hosting site. In this light it is quite a surprise that some employees at the FBI appear to be sharing copyrighted material out in the open, through BitTorrent. Based on public data from BitTorrent monitoring company ScanEye we found several BitTorrent “pirates” linked to IP-addresses that are registered to FBI’s Criminal Justice Information Services Division. Below is a snapshot of some of the “hits” we found. 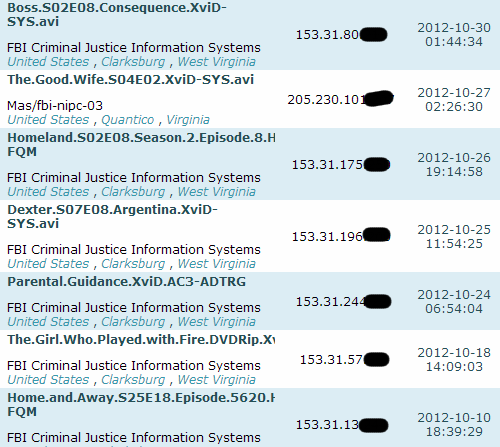 As can be seen above there is a particular interest in movies and TV-show downloads at the FBI’s largest division. Some of the titles are relevant to the intelligence community such as “Homeland”, “The Girl Who played With Fire”, “The Good Wife” and “Dexter”. Other titles, including the Aussie soap opera Home and Away, are more general entertainment. The big question is of course why these FBI IP-addresses are showing up in BitTorrent swarms. The most likely explanation is that employees were downloading these videos for personal entertainment. This wouldn’t be much of a surprise really, as we’ve seen this before at congressional offices the Department of Justice, national parliaments, record labels and movie studios. Another option is that the FBI is downloading the torrents as part of an ongoing investigation. However, this is less likely as ScanEye shows that the downloads are spread out over several months. Or perhaps the IP-addresses were spoofed by Kim Dotcom to get back at the feds? c There are 163 comments. Add yours?